When I was in Italy it was about tasting the flavors of each season, traveling around Tuscany, stopping by a frantoio to taste olive oil and sampling Chiantis while sitting among their vines. I recently wrote a post about Buffalo Mozzarella, researched and summarized Vin Santo (Tuscany's traditional dessert wine), and have written specific posts on Morellino di Scansano (red wine, southern Tuscany), artichokes (filled stalls in markets all spring) and Fava Beans. I am still in learning mode (this might be a perpetual thing for me... like a redundant state-of-mind, but I digress), and loving every minute. 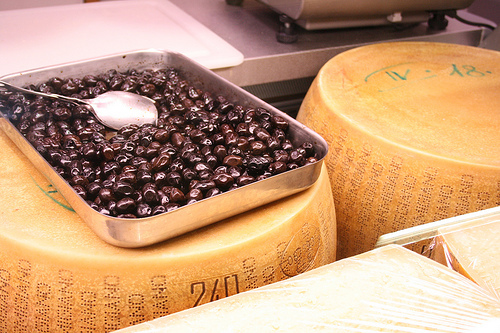 Italy provides an enticing list of ingredients to consider---Grana Padano and Parmigiano Reggiano are two of them. If I wasn't paying attention, I would have thought both were just 'Parmesan cheese.' Actually 'Parmesan' is more of a catch-all term, frequently used in America, referring to hard, dry, sharp-flavored Italianesque cheeses. That serves a function, but so does knowing just a bit more---and appreciating the differences between heirloom Italian cheeses. Parmesan is a nick-name, but stems from Parmigano Reggiano: a cheese from the Parma and/or Reggio Emilia region of Italy. A similar cheese from a neighboring region is Grana Padano. Monks in northern Italy's Po valley encouraged the breeding of cattle for food/milk as early as the 11th century; the excess milk was made into long-aging cheese in what we know today as Grana Padano (the same story applies to Parmigiano Reggiano, 2 centuries later). Both cheeses are DOP controlled: they have specific methods for processing and again, are from designated geographical zones and each wheel of cheese is tested for quality. They are both cooked, pressed, semi-hard cheeses made from cow's milk. Both use high quality milk, rennet and salt; while aging, the wheels are humidity and temperature controlled, cleaned and flipped regularly. The cheeses' colors and flavors differ, largely due to different grasses grazed by milk-producing cows. it must age at least 12 months. made with mix of whole and skim milk. it is produced in Parma, Modena and Reggio Emilia, as well as parts of Mantua and Bologna. a golden straw color, which deepens with age. the gold seal (aged 30 months; crumbly, nutty and spicy). must age at least 9 months. made with partially skimmed milk. produced in Lombardy, Piedmont, Trentino and Veneto regions (the Po River Valley). more white spots/crystals appearing [appropriately] with age. young Grana Padano will taste clean and milky (aged 9 mo. ), aged longer will bring notes of straw, butter and hay (aged 16 mo. ); the reserve cheese adds layers of dried/roasted fruit and beef stock (aged 22 mo.). it takes 60 gallons of part-skim, unpasteurized cow's milk to make one 80 LB wheel of cheese. each pound of cheese contains the concentrated nutrients of 2 gallons of milk. there are big differences within a grade of cheese, primarily due to aging; optimal aging is around 2 years. the more the cheese ages, the more crumbly/grainy the texture. 'Padano' means 'of the Po River' (river’s Latin name Padus) and 'Grana' means grainy---referring to the cheese's grainy texture. four million wheels of Grana are made per year versus two million wheels of Parmigiano. So next time you are grabbing 'Parmesan' at your grocers, look a little closer. Does it say Grana Padano or Parmigiano Reggiano? Are their stamps or symbols? How long has it been aged? Is it white or golden yellow? Pay attention while you taste the cheeses, and over time, you will notice subtle differences. Picture Italian cattle grazing on grasses from different regions of Northern Italy. It is their grazing---and age-old, well-preserved techniques and care---that deliver these unique, divine and nutrient-rich cheeses. Jul 29 What is the difference between: Parmesan, Pecorino, Asiago, Romano?